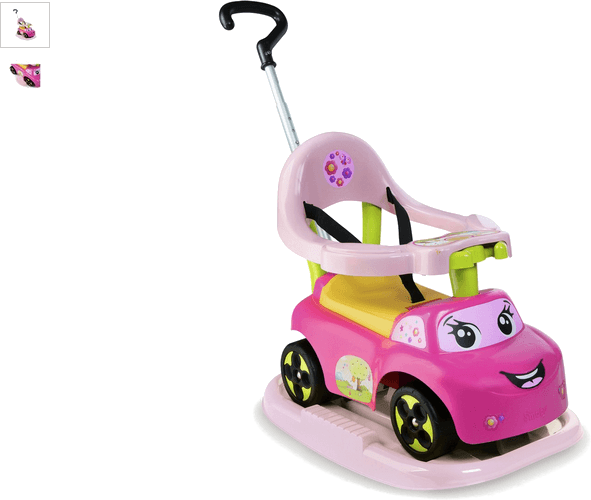 The Smoby Auto Bascule (Rose coloured) is a fantastic four in one (4-in-1) ride on that can transform as your little one grows without compromising safely (has adjustable safety belt and front and rear non-topple devices). Starting out as a rocker for enthusiastic young children, its really easy to remove the rocking base to transform it into a fantastic push along ride. As your most cherished grows whip off the safety ring and the Smoby Auto Bascule becomes a brilliant walker and play structure. With a quick adjustment you have a full foot-to-floor ride on too. Wow, amazing! On top of all that features include an electronic horn and a discreetly hidden toy box under the seat but keep that to yourself, it's a secret! Get money off with April 2019 free Argos voucher codes, see if there's a promo code for the Smoby Auto Bascule - Rose product. Argos may be out of stock of this product. To enhance your shopping experience you may also be redirected to a search results page when you click an outbound link.